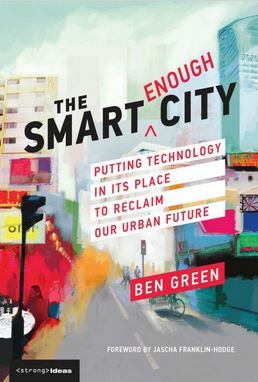 In this book “The Smart Enough City: Putting Technology in Its Place to Reclaim Our Urban Future”, Ben Green focus on how big data, AI and machine learning could promote more efficient and livable cities, without sacrificing civil liberties and social justice. Warning us against the exclusively technical view of urban life, he underlines the need to recognize the complexity of urban life rather than see the city as something to optimize. The book is part of the Strong Ideas series, published with the support of the MIT Libraries. Smart cities, where technology is used to solve every problem, are hailed as futuristic urban utopias. We are promised that apps, algorithms, and artificial intelligence will relieve congestion, restore democracy, prevent crime, and improve public services. Cities should strive to be smart enough, meaning to embrace technology as a powerful tool when used in conjunction with other forms of social change—but not to value technology as an end in itself. In a technology-centric smart city, self-driving cars have the run of downtown and force out pedestrians, civic engagement is limited to requesting services through an app, police use algorithms to justify and perpetuate racist practices, and governments and private companies surveil public space to control behavior. Green describes smart city efforts gone wrong but also smart enough alternatives, attainable with the help of technology but not reducible to technology: a livable city, a democratic city, a just city, a responsible city, and an innovative city. By recognizing the complexity of urban life rather than merely seeing the city as something to optimize, these Smart Enough Cities successfully incorporate technology into a holistic vision of justice and equity. Ben Green is an Affiliate and former Fellow at the Berkman Klein Center for Internet and Society at Harvard University and a PhD candidate in Applied Mathematics at Harvard’s John A. Paulson School of Engineering and Applied Sciences. From 2016 to 2017 he was a Data Scientist in the City of Boston’s Department of Innovation and Technology. Strong Ideas is a hybrid print and open access book series for general readers. It provides fresh, strongly argued, and provocative views of the effects of digital technology on culture, business, government, education, and our lives. Books in the Strong Ideas series are published in print editions for sale in bookstores and in digital open access editions available on the PubPub platform. The Strong Ideas series is published with generous support from the MIT Libraries. Read the book online here. Buy a hardcopy of the book here.